Today I am running into Godzilla at every turn. Now I'm not one for superstition, but if that's not an omen in the making to do a posting on the guy, I'll stomp on a small Japanese city. This one I hit, is a pretty gruesome yet stylish poster of Goddy and his internal organ set-up. Where do people get jobs where they get the time to think about the anatomical structures of fictional creatures? The Tax department? Either way I want one. Not for this though, for that work/life balance I hear so much about. 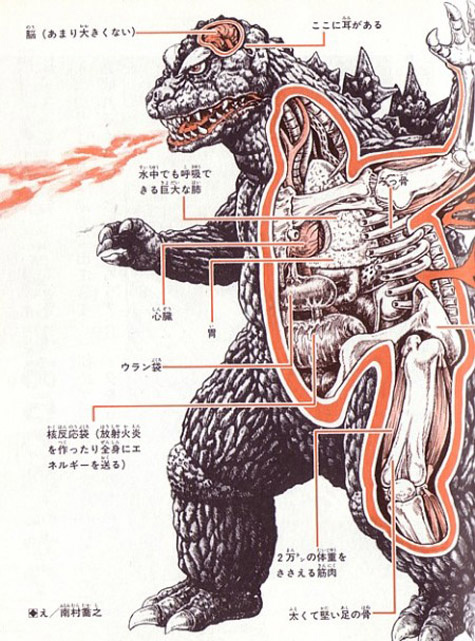 Godzilla wasn't alone though - find the anatomy of many of his adversaries finely detailed in print right after the jump. If you find the place, save me a cubicle when you get there because I want in. This combines two of my favorite things: Godzilla and sketching trivial or useless things. They also happen to be 2 of the only things I'm really good for so it all works out. I'm prepping my resume when I get home. same goes for me if you do find me this place i'd like to email my resume. it's been a looooong time since i've had a job i woke up to most every day looking forward to being at. although it's hard to say how much work we would be getting done if the three of us were all working in the same dept. They get a job making those really cool books my daughter is always checking out of the library. The ones where they have the detailed history of dragons and how they evolved over time. OOOH! The three of you could start a show like the Sportswriters! Although instead of sitting around a poker table discussing sports, you could discuss comics and movies and all other types of things! That way the goofing off would be part of the job! Random, now that's a sweet idea. It could be like a webinar, simulcast from across the globe: NZ, the West Coast, and the Nawtheast. And you could have holographic images of yourselves sitting around a table with comic book boxes stacked in the corners and posters of Attack of the Fifty Foot Woman on the wall! Oh. I like this idea. and we could have the rotating 4th geek every month/week (however often we do it). I'm sure we could get IFF to join in the fun. We'd be like the jedi council, only far less useful. I'm liking this idea more and more.